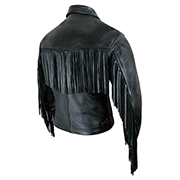 The 8" fringes on this lightweight leather motorbike jacket really deliver the wow factor thanks to the jackets otherwise understated design. 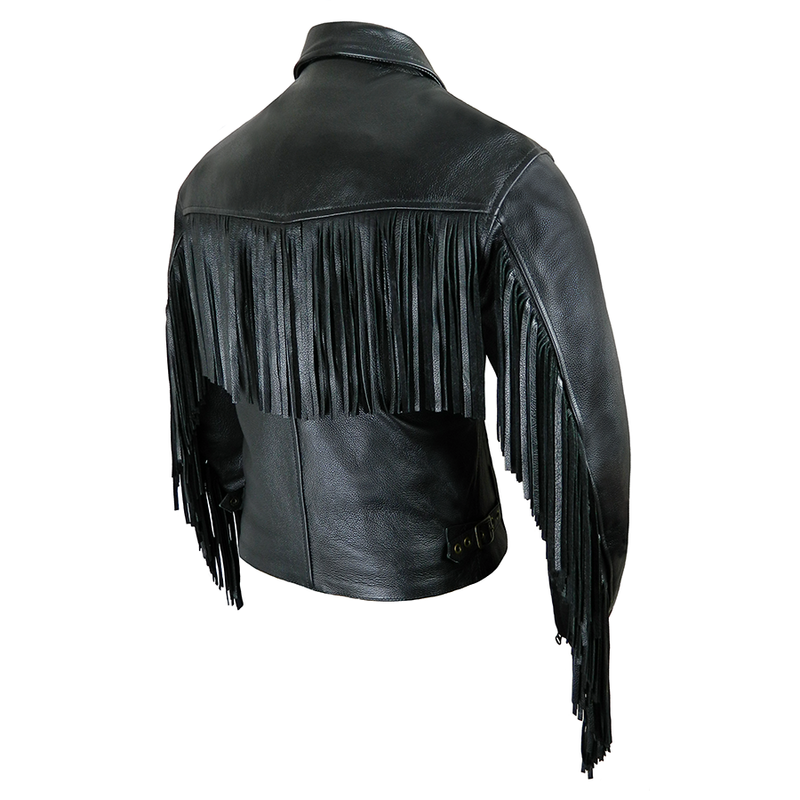 As with the non-fringed Classic Rock, this summer leather jacket is also made in supple, finest quality, black cowhide with a cotton lining. The main zip is central fastening and concealed, to maintain the sleek look, with a storm flap behind the zip. The collar has concealed press studs. Two internal pockets (one zipped). Zip cuff openings with leather gusset. 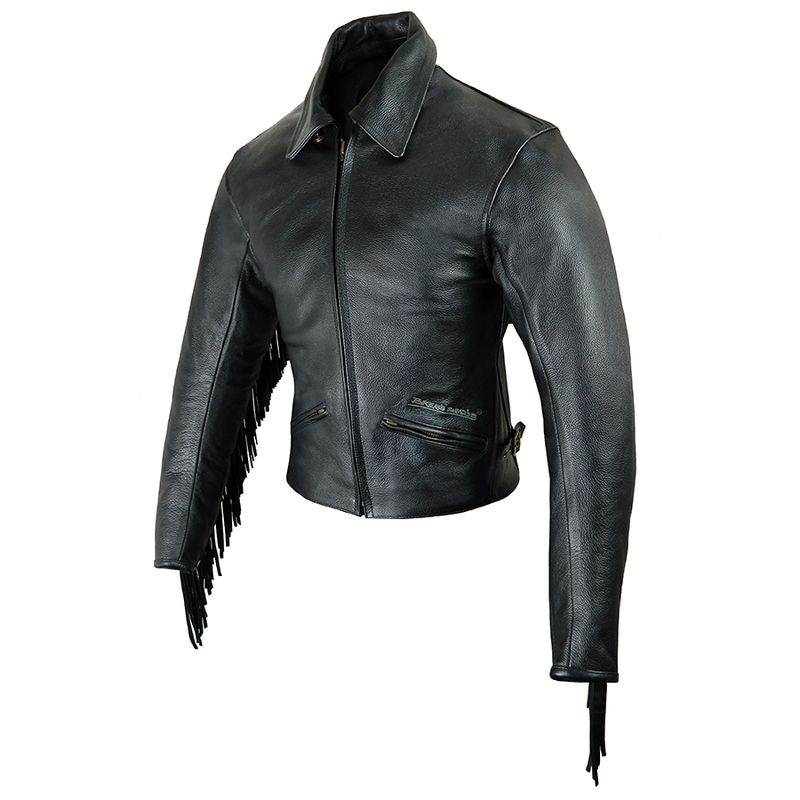 If required, this jacket takes Viscotec CE memory armour. - Check we have your required size from the size options on this page. - Call us on 024 7646 6296, 7 days a week, 10am-4pm (leave a message outside of these hours and we'll get back to you). We'll take your order. You can either pay by card (UK only) or we'll send you a PayPal invoice. 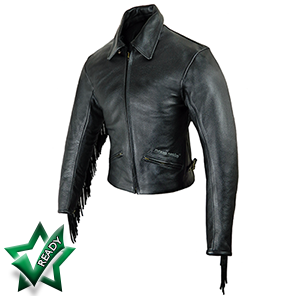 - Send your old leather jacket to us: Part-Ex, Bikers Paradise, Coventry, CV4 9UY. 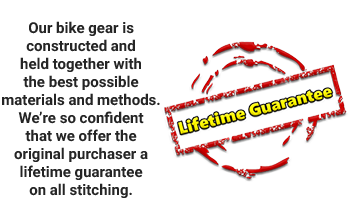 - We'll send your brand new Bikers Paradise jacket to you at a £60 discounted rate (plus up to an extra £10 for posting your old jacket to us). - Alternatively, visit our Coventry showroom to take advantage of this offer but please note that you won't qualify for the additional £10 postage discount and the offer only applies to the jackets bearing the part-ex sign on this website. - If a refund is required, we must receive the new jacket back within 7 working days of you receiving it (after 7 working days, if we haven't heard from you, your old jacket will be recycled). £6.50* will be deducted from your refund to enable us to return your old jacket to you. *If your old jacket is to be returned to a Scottish Highland postcode, £15 will be deducted from your refund for shipping your old jacket back to you. - If you want to exchange for a jacket that isn't included in our part-exchange offer, we'll return your old jacket with your new exchange and the extra cost for the new jacket will be charged. You must return the first new jacket within 7 working days of receiving it - or at least notify us. After 7 working days, your old jacket will be recycled and we'll be unable to return it to you. - If you require an exchange for another part-ex eligible jacket, you are responsible for return and exchange delivery costs.